By the weekend, unseasonably cold temperatures will accompany our first chance of accumulating snow this season. You're waking up on this Tuesday morning with temperatures near 50 degrees — that's closer to normal highs (46 to 49 degrees) than normal lows (31 to 33 degrees) for early December! We'll hold on to mild temperatures throughout the day, as thermometers make a run for 60 degrees. However, with an approaching cold front in the forecast, this relative warmth does not automatically entitle us to a nice weather day. Skies are already mostly cloudy, likely to become overcast by late morning. It will also become breezy throughout Tuesday, with gusts to about 20 mph. And finally, we've got some rain on the way, in two batches. The first round will arrive by late morning — just scattered showers and drizzle, mainly across northern and central New Jersey. Nothing to write home about, not everyone will get wet, on-and-off, hit-or-miss, etc. 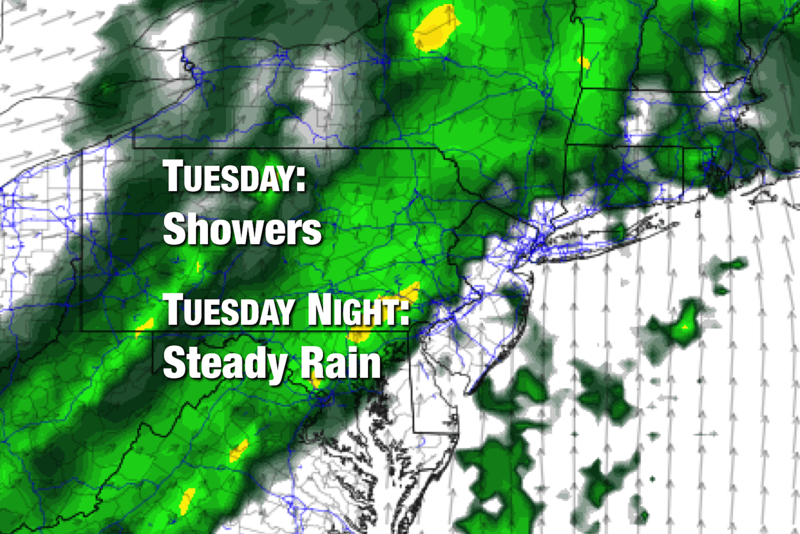 The second and more significant round of wet weather will arrive Tuesday evening. A period of steady rain is likely across the state between about 6 p.m. Tuesday and 6 a.m. Wednesday. I expect rainfall totals in the quarter-inch to half-inch range. Beyond the rain, temperatures will start to tumble on Wednesday, despite the return of sunshine. A brisk westerly wind will push thermometers downward throughout the day — look for upper 40s around mid-morning, potentially falling into the chilly upper 30s by early evening. Most of New Jersey will experience a freeze Wednesday night into Thursday morning, with forecast low temps between 26 and 34 degrees. Thursday will be noticeably cooler than the past few days, but overall it shouldn't be too bad. High temperatures in the mid to upper 40s would actually be close to normal. I've sided with dry weather and partly sunny skies for Thursday's forecast. However, it's worth mentioning that the NAM model keeps persistent clouds and showers over New Jersey for much of the late-week period. I think it's important to note that the cold settling in by the end of the week will be a sustaining cold. In other words, temperatures will remain below seasonal normals through at least early next week. In other other words, whenever our next storm system arrives, it will likely bring some mode of wintry weather to New Jersey. In Monday's weather blog post — A busy weather week for NJ: Cool, mild, rain, cold, snow — I referenced three chances of snow in the coming week. I've already ruled out the first, on the backside of Tuesday-Wednesday's cold front (see above). The second is still alive (but barely) for the Friday-Saturday time frame. The third storm system, scheduled for Sunday, may also whiten the Garden State. So let's talk about Friday's potential snow, which could begin as early as Friday afternoon and lingering through part of Saturday morning. The early Monday morning GFS model painted a very snowy picture for the entire state, with a bullseye of 7+ inches along the southern coast. 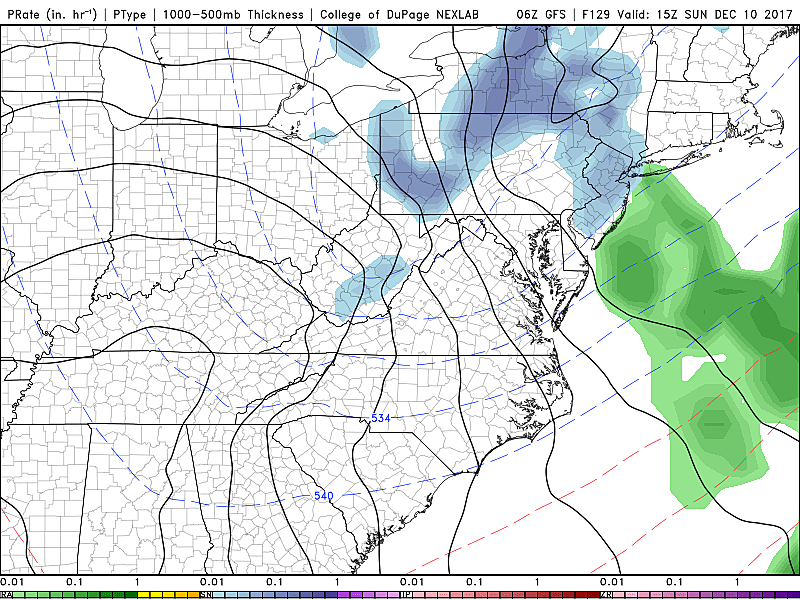 Over the following three model runs, the GFS shifted the coastal storm system far away from the Jersey Shore, zapping away almost all chance of accumulation. As of the latest run of both the GFS and the Euro, the forecast storm track has shifted back toward a coast-hugger solution. So light snow is back on the table for the southern coast of New Jersey, on the order of "a few inches, at the most". We're still watching carefully and, once a consistent consensus solution emerges, we'll be able to add more detail this forecast. No matter what happens late Friday and early Saturday, another storm system early Sunday could produce another quick shot of snowfall. This one will be coming from the west — a clipper system, if you will. Such systems are generally moisture-starved and unimpressive, and this one is no different. 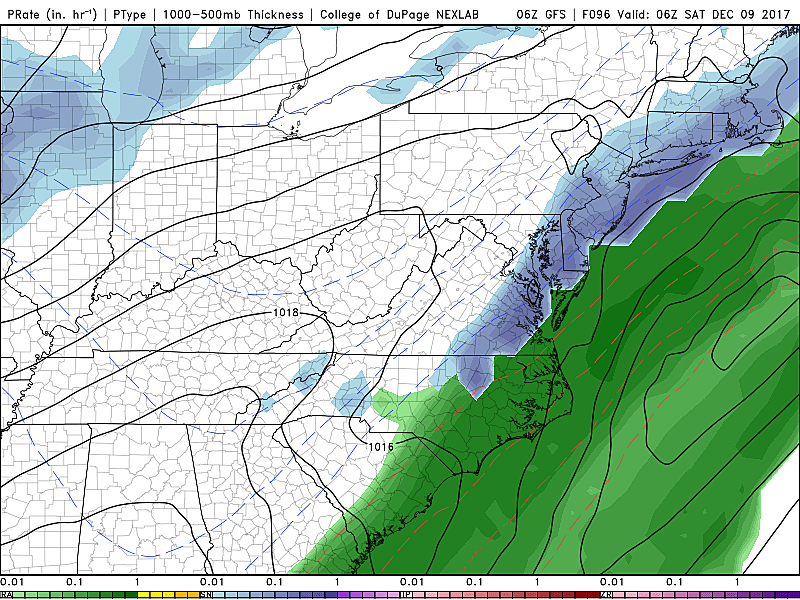 While light accumulations are possible through the day Sunday, I presently don't think it's going to be significant. Again, worth watching for now.